The dread Yugo Throat had thousands of visitors in its grip, and the sun shone on Sarajevo for approximately 15 minutes in the 13 days of the XIV Winter Olympics, yet everyone's mood was upbeat. How could this be? Well, for Americans the unprecedented feats of their Alpine ski team—a tour de force that produced a treasure chest of three gold medals and two silvers—made their chests swell and hearts thump, even though as a whole the U.S. team had come up with far fewer medals than expected. For others, the Sarajevo high was also buoyed by the radiant smiles and tears of joy of the 182 men and women who won medals and by the pride emanating from the elite few—just three of the 1,437 competitors—who won more than one individual gold. Certainly, the inspiriting races of the indomitable Marja-Liisa Hämäläinen of Finland, the first woman ever to earn three individual gold medals in cross-country (and a bronze in the relay), gave the Games a glorious luster. So did the rejoicing of Canada's Gaétan Boucher, who got two golds (and a bronze) in speed skating. And so did the performance of Karin Enke, the East German who took home two golds and two silvers in speed skating. Finally, there was the infectious enthusiasm of the Yugoslavs for their own athletes. Native sons and daughters turned out in vast, dark-clothed multitudes whenever their compatriots competed. They had great expectations for their 21-year-old ski jumper, Primoz Ulaga, who had won the 70-meter event off Sarajevo's Igman jump in the pre-Olympics last winter, and they watched with open mouths and stopped hearts when he soared in the Games. Alas, Ulaga flew only far enough to finish 57th off the 70-meter hill and 13th off the 90. Bojan Križaj, the premier Yugoslav Alpine racer, fared better—ninth in the giant slalom and seventh in the slalom—but it was Jure Franko, 21, from the village of Nova Gorica in the Julian Alps, who became the hometown hero. He made two stirring runs in the men's giant slalom to finish second to Switzerland's Max Julen. Franko's silver is the first Winter Olympics medal a Yugoslav has ever received, but it won't lead to riches. "I may get some money from the medal, but not big money," said Franko. "I get $50 a month from Elan skis and $50 a month from my ski club. I can live on this money for a long time." The U.S. supposedly had sent its best team ever, and in a way it was the best ever. True, the Americans won only eight medals, including four golds, but a number of U.S. athletes achieved notable, if non-medal, performances. Jeff Hastings' fourth place in the 90-meter jump was one of those. It was the best U.S. finish in ski jumping since 1924. Unexpected, too, was the American four-man bobsled team's fifth place. Not since 1956, when the U.S. got the bronze, had an American four-man bob come in as high. Speed skater Nick Thometz finished fifth and fourth, respectively, in the 500- and 1,000-meter races, which was much better than he figured to do. And the 15th place attained by the bruised luger, Bonny Warner, was the best ever by a U.S. woman in that sport. But for Americans who count medals as the only symbol of success, the real splendor of the Sarajevo Games in their last few days lay in the magnificent attainments of three men. First was Bill Johnson, 23, of Van Nuys, Calif. A shockingly cocky newcomer to ski-racing stardom, Johnson swaggered and bragged like a gunslinger before he swept down the Bjelašnica downhill course last Thursday to become the first American to win a gold in that event. Then on Sunday came the double-image oldtimers from White Pass, Wash., Phil Mahre, 26, and his twin, Steve, whom you can now tell apart because Phil wears gold and Steve silver from the slalom race. They, too, had been stunning people all week by saying that they didn't much care about Olympic medals because they had already pretty much made their fortunes. Of course, when it came time to find out whether they really cared, they left no doubt. The Mahres cared a lot—and as a result their already sizable fortunes will swell considerably. But perhaps not as quickly as that of the fast-talking Johnson, who, when asked what winning the gold medal meant to him, responded, "Millions. We're talking millions." As many journalists noted, Johnson's braggadocio, his delinquent youth, his tendency to be a loner and his open dislike for any semblance of ski-team authority constituted an uncanny replay of both the Robert Redford character and the story line in the 1969 movie Downhill Racer. Johnson thought so, too. No sooner had he finished his first training run than an Austrian TV news team asked him if he was familiar with the film, and he replied, "I've seen it many times, and that's exactly the way it'll happen now. You can start writing your story. This course was designed for me, and everyone else is here to fight for second place." Such outrageous egoism brought instant comparisons with such braggarts of sport as Namath and Ali. Johnson's victory drew wildly diverse reviews from the hordes of American sportswriters in Sarajevo. Reactions ranged from dour predictions of a bad end for Johnson ("There's a gold medal that's going to end up in a pawn shop") to huge delight in the melodrama of his life ("My God, just think. The kid is damn near sent up the river to the big house, then turns himself around and wins the gold medal. How American can you get?"). Well, it wasn't quite that melodramatic, although Johnson and trouble were close pals in his youth. He was born in Los Angeles and grew up in the Mount Hood region of Oregon. He began skiing at six, and he was a downhiller from the first. "I used to bomb the rope tow when I was seven," he says. "Then, when I got older, I bombed the whole chairlift run. I never bothered to learn how to turn." He apparently never bothered to obey adults, either. Steve Bratt, who's director of skiing at the Mount Hood Meadows slopes and was Johnson's first coach, says, "I had to remove him from the ski team twice for fighting. He was a misfit, but not in a negative sense. He was just extremely independent and an extreme loner. But he was a winner. You always knew that whatever he did, he would be the best in the world. If he chose to be a thief, he'd be the best thief on earth." Johnson's parents got divorced when he was 16, and though he remains close to both of them, the split troubled him. He frequently skipped school to go skiing, but he did have boosters on the faculty of Sandy Union High in Sandy, Ore. One was Peggy Hart, a social studies teacher and Johnson's counselor when he was a senior. "Personalitywise and behaviorwise, he was a real pain in the neck," she says, "but our relationship was very positive. All of his energies were in skiing. Still, he graduated with a B-minus average, in the top third of the class, and he was outstanding in subjects he liked, such as geometry and physics. He was a very bright young man." He still is. Johnson is a tournament-class bridge player and a crossword-puzzle addict. Moreover, says his father, Wally, a computer analyst in Cerrito, Calif., "Don't ever get in a chess match or a gin rummy game with him." There was nothing but blue sky as far as I could see. The wind was blowing toward us. It was 20 minutes to 12. That was the first time it really hit me. This was the Olympics! Johnson nearly did choose to be a thief, however. One night late in 1977, he and a friend were cruising around near Portland, Ore. when they saw a car parked on a deserted stretch of road. As Johnson tells it, "We looked at it and said to each other, 'Hey, that looks like it's got a pretty good engine in it.' It was a '56 Chevrolet, all beefed up. So we towed it away, and the police picked us up two days later. They wanted to take me to adult court. I was 17, but real close to 18. That really threw a scare into me." Instead, a juvenile-court judge heard the case and let him off with a warning. Johnson entered the Mission Ridge Academy at Wenatchee, Wash., a skier's school with a daily curriculum that included four hours of class and four hours of race training. To help his parents pay the cost of his attending the academy, Bill would get up at 5 a.m. to wash dishes at a Big Boy restaurant. Though he was winning races, Johnson knew the Northwest skiing establishment wouldn't recommend him for the U.S. national team. So in 1979, he received a scholarship to the Alpine Training Center in Lake Placid. He was named to the national team in '80, but his troubles weren't over. Still recalcitrant, he was bounced from the squad in the summer of '81 for refusing to do dry-land drills. He made the team again the next year, but he continued to irk his teammates with his arrogance and quick temper. They called him Hatchet Man behind his back. As recently as last month, many members of the U.S. team assumed his days were numbered. Johnson's World Cup performances in 1983-84 had been uniformly uninspired—41st, 26th, 20th, 45th, 23rd—except for a fourth at Cortina, Italy and one dazzling victory on Jan. 15 at Wengen, in Switzerland. That win was labeled a fluke, and coming into Sarajevo, Johnson wasn't highly regarded. Nor was he under any pressure to win. So he created pressure for himself with his boasting. To be sure, he did know what he was talking about when he said the course was designed for him. The top half had some steep, tight turns, and Johnson is described by everyone except himself as being very poor at turns. He is, though, terrific at gliding, an unteachable talent that enables a skier to flow at fierce speeds over relatively flat ground. He and Theo Nadig, the U.S. downhill coach, figured that Johnson could lose as much as .8 of a second to better turners on the top half and still pick up enough on the much straighter bottom part of the run to eke out a win. Johnson's training runs were spectacular—two firsts, two seconds and a fourth. For more than an hour before the race, which had been delayed a week because of bad weather, the bad boy of Sarajevo milled around with other competitors in the restaurant on top of Bjelašnica. He dipped snuff, made small talk and gazed absently out the back window toward a far-off mountain range. Then it suddenly seized him. "There was nothing but blue sky as far as I could see," he recalls. "The wind was blowing toward us. It was 20 minutes to 12. That was the first time it really hit me. This was the Olympics! I really started getting nervous. I had to cool down. I put everything out of my mind and started concentrating." His concentration was terrific. His split for the first half of the run was fourth best, only .56 of a second behind the leader's. The race was Johnson's. Photographers and reporters crushed around him, and after more brash remarks, including a jab at U.S. Alpine director Bill Marolt—"He's probably taking all the credit, but I thought it was me in the starting gate up there"—Johnson ducked into a trailer, where he drank from a bottle of Yugoslav champagne. When photographers implored him to take a drink in camera range, he sent out word: "I can't. Athletes don't drink." The gold was an explosive surprise for the U.S. team. But for the European skiing establishment, it was a paralyzing turn of events, a happening as unthinkable to them as an Austrian's hitting a World Series-winning home run would be to Americans. Since the Olympic downhill made its debut as part of a combined event in 1936, no U.S. male had finished better than fifth. Further, until Johnson himself won at Wengen, no American had won a downhill in the 16-year history of World Cup racing. Having skiing's most hallowed prize stolen by any American would have been hard enough for the Europeans to take, but this particular damn Yankee made the loss almost too much to bear. Johnson had probably set an unbreakable Olympic record for running off at the mouth. And he certainly will forever hold the world mark for incessant public references to nose picking. To be sure, Austria's venerable champion, Franz Klammer, 30, had started things off by calling Johnson a Nasenbohrer after Johnson's Wengen victory. Even though the literal translation of the term does indeed mean someone addicted to digital exploration of the nostrils, it's commonly used as a mild insult, meaning a rather childlike tenderfoot. By that definition, most of the gold-medal successes in Alpine skiing were produced by die Nasenbohrer. Besides Johnson, there was Debbie Armstrong, 20, of the U.S., who swept out of nowhere to win the giant slalom on Feb. 13. It was her first important victory. And what about the sweet-faced Swiss, Michela Figini, who won the women's downhill? Just 17, Figini joined her country's A Team only three months ago and won her first significant downhill just two weeks before the Olympics. But the tenderest tenderfoot of them all was the sobbing Italian, Paoletta Magoni, 19, who slashed down the fogbound women's slalom course on Jahorina to win the first big race of her life. These were all indeed Nasenbohrer of the first order. However, starting now and forever more, let's change their group label to die Wunderkinder. In truth, it's not rare for unknown ski racers to win at the Winter Games. In fact, it's not unusual for a competitor to excel for the first time in an Olympics, a la Armstrong and Magoni. The reason is simple: These tyros can frolic down the courses because they're running with no pressure. The weight of expectation laid on reigning champions and serious contenders is a terrific burden. In racing at this level a microscopic mistake can cost a medal. This is why veteran skiers always say they dislike being measured by the single-race standards of an Olympics. They much prefer the season-long results of the World Cup circuit to separate the tough guys from the tenderfeet. No one in Sarajevo seemed less impressed with the Olympics than the Mahres, even after they had finished one-two in the slalom. Amid the finish-line excitement, a calm Phil told a shouting, shoving mob of journalists, "This, to me, is just another victory. It's an unfortunate thing about the Olympics that everybody just weighs medals. It's wrong to say this is the best day of my life. If it is, what am I going to do with the rest of my life?" That's a rather mature thing to say at any time, but to do so in the mad moments immediately after a high-pressure Olympic victory is a commendable act of honesty—to say nothing of self-control. As much as the bowling-trophy collectors of the world may dislike the twins' disdain for baubles, the Mahres have never wavered in their insistence that Olympic medals don't measure a skier's true excellence. As it turned out, the medals the Mahres brought home from Sarajevo proved their point beautifully. For one thing, the two hottest slalom skiers on the World Cup circuit this season weren't allowed in the Olympics. 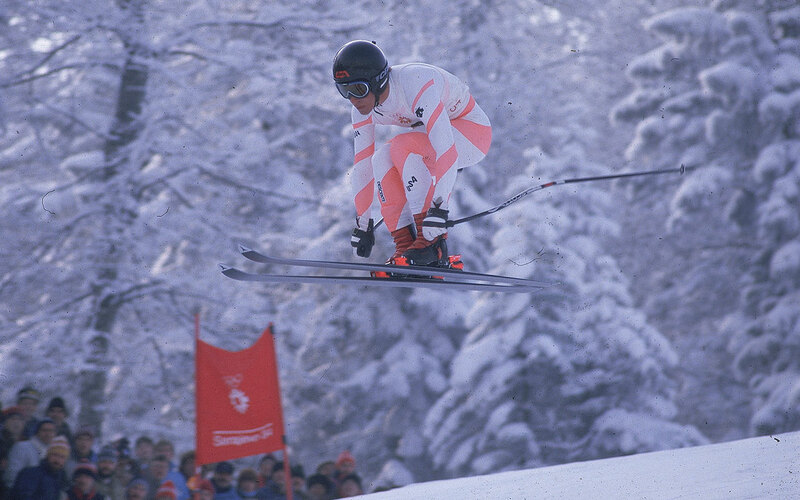 Luxembourg's Marc Girardelli, who has won three World Cup races in 1983-84, was barred because he's really a citizen of Austria. Sweden's Ingemar Stenmark, the best slalomist of the era and winner of six races this season, missed the Games because of a tangled problem involving professionalism. Then, in one of the more destructive first runs ever in an Olympic slalom, no fewer than seven of the top 15 seeds hooked slalom poles, skidded off the course or went flying off the run after slamming into ditchlike ruts. Said Phil, "This is a difficult hill. You can't make a mistake. You have to be aggressive. The snow wasn't real hard or real soft, but it got shattered. It was pretty choppy toward the bottom." Finally, the exuberant Yugoslavs cheering for Kriżaj whooped and whistled in an attempt to intimidate his opponents. Later Kriżaj said in disgust, "I was very disappointed with the crowd. They were like soccer fans." After the first run, Steve was in first with a time of 50.85, and Phil was third, .7 of a second behind. The other skiers who had made it down the hill were generally so poor that the competition vaguely resembled the Mahres against the Aspen High racing team. That, however, didn't guarantee them medals. Phil, the defending three-time World Cup overall champion, had been having his worst season in memory. His best Cup finish had been fourth. For his part Steve had only a third-place to show for his efforts on the Cup circuit. 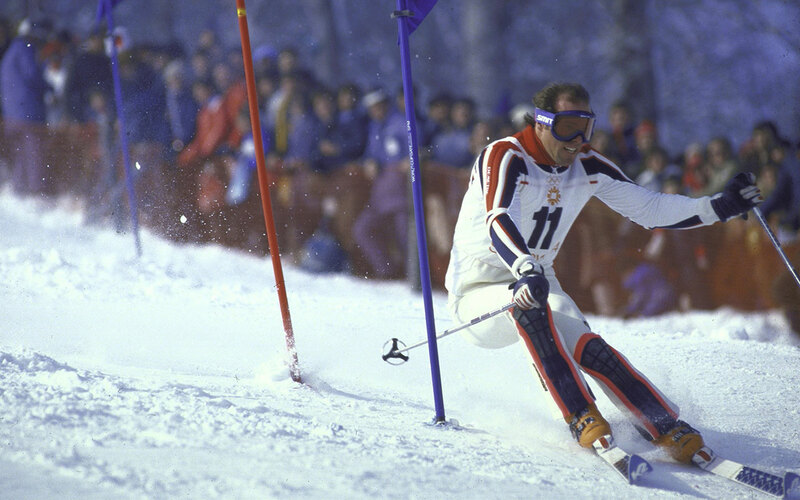 In the giant slalom at Sarajevo, they each had made at least one clattering, overeager run, and Phil finished eighth, Steve 17th. But in the second run Sunday, Phil delivered a flawless performance. His combined time was 1:39.41. Steve went two skiers later, and his run was so jarring, so heavy in a couple of turns, it didn't seem possible he would finish among the first five. He probably wouldn't have, had this been a regular World Cup slalom instead of the Olympics. The Games were almost certainly the twins' last hurrah in Europe, for they will retire this year. Both are sick of ski racing, and both want to live at home with their families. Both have passed the point of caring, and their negativism is crippling. However, in this valedictory triumph, they pulled themselves back to where they belong—on a pedestal. 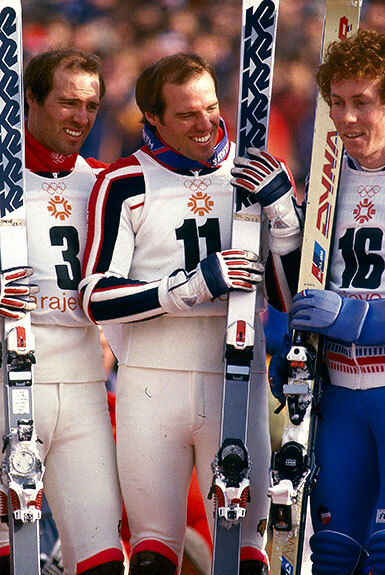 They have—double-handedly, as it were—made men's ski racing an American sport. They are the best two racers the U.S. has ever produced. Perhaps the crown will pass to the bright and recalcitrant downhiller with the rampaging mouth. But if Johnson doesn't assume the throne, another candidate who came on the scene the same day Phil got his gold just might. At 1:37 a.m. Mountain Standard Time Sunday, just four hours before Phil won his gold medal, his wife, Holly, gave birth to an eight-pound, 13-ounce boy in Scottsdale, Ariz. He may not be a contender for a while, but, in 20 years, who knows? We all know from the Games of Sarajevo what a little Nasenbohrer can become.